As a lover of nature and all things symbolic there is nothing more moving to me than a mountain metaphor. The peaks and the valleys of life are the moments in which we experience our highest highs and, naturally, our lowest lows. I am drawn to the mountains for many reasons, one of which being that they are my natural habitat. Growing up in Vermont I grew up accustomed to the embrace of the Green Mountains. As such, I have always felt at home in the protection of a great mountain. And so, whether they are soft and green or jagged and rocky, it’s undeniable that the mountains are where I feel a sense of true belonging. On this trip to Poland, I had two objectives–culture and nature (mountains), and I am grateful to say that I got everything that I wanted and more. 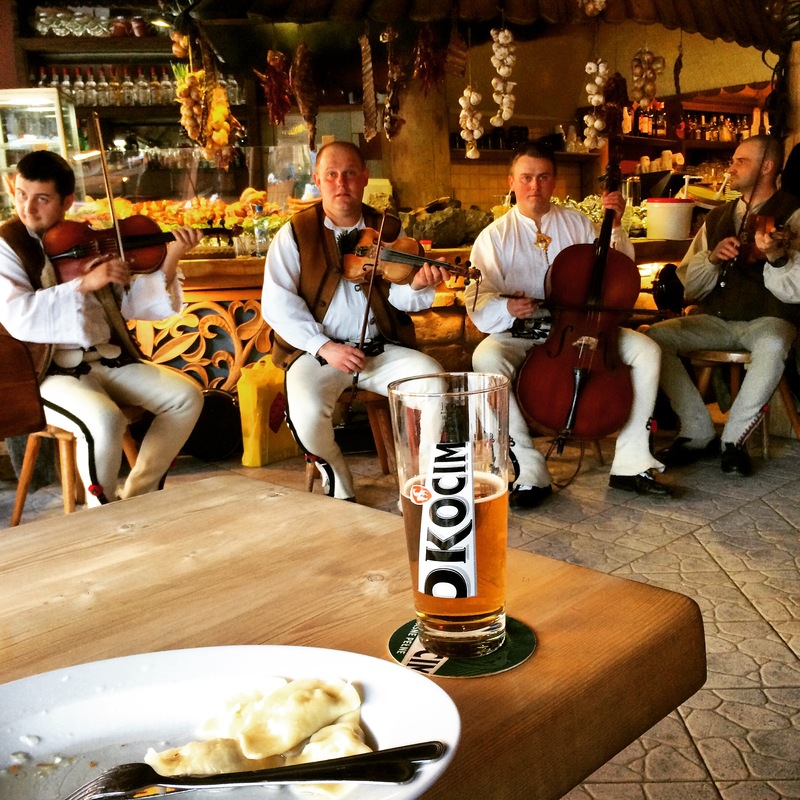 I just spent the last 3 days in a city called Zakopane, which is nestled away in the Polish Tatra Mountains. 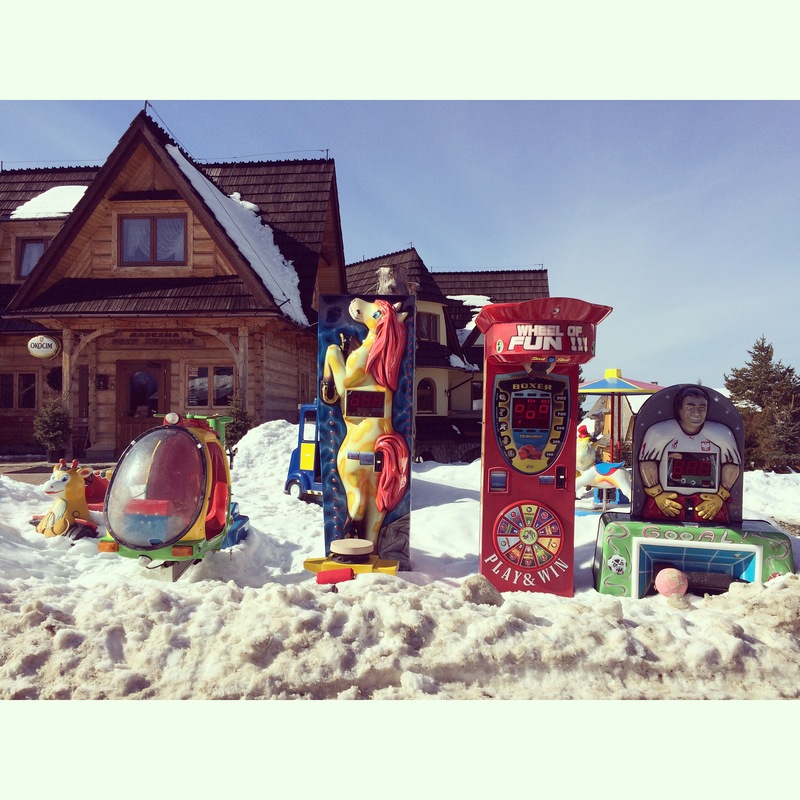 The down town itself is kitschy and touristy, but the mountains that surround Zakopane are magnificent and majestic. What’s more, the room I had booked for three nights in a quaint bed and breakfast called Domki Javorina, was a little slice of heaven on earth. 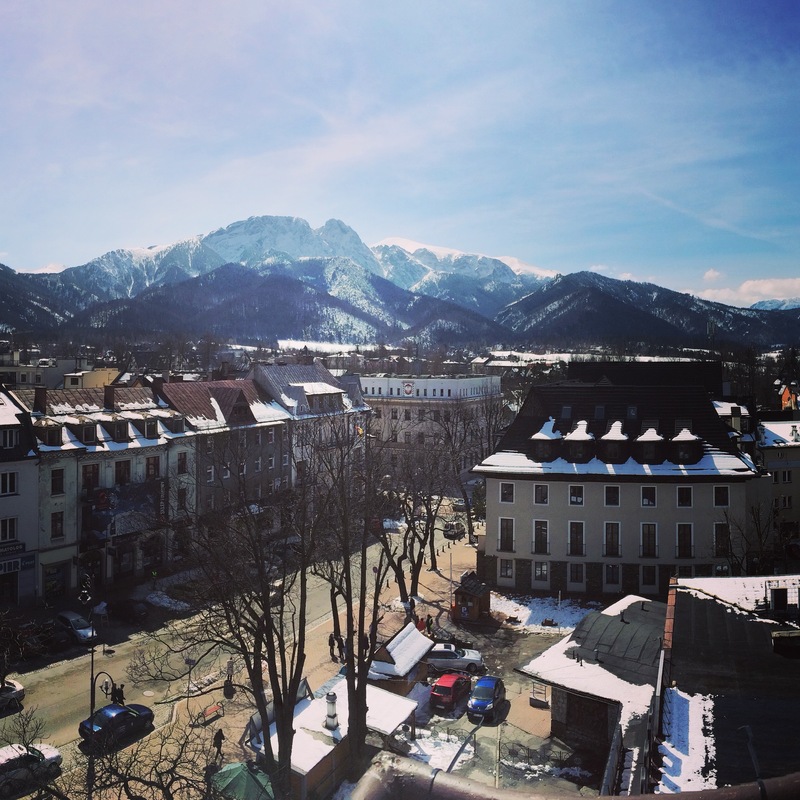 I arrived in Zakopane on Thursday morning with one intention–to get myself as swiftly as possible to the peak of a mountain. I wanted to experience the natural and metaphorical high of climbing into the clouds. And like any outdoor junky feels in the presence of a gorgeous mountain range, I knew that the Tatra’s would give me my fix. Day one in Zakopane didn’t offer enough time to bus myself to the national park, so I opted to hike up to the top of a nearby ridge recommended by the sweet lady at my B&B. To my disappointment. there were so many strange tourist attractions on the top of this mountain, and it annoyed me that man had conquered this place and put up ridiculous games and restaurants in order to turn a profit. It was a low moment, in which I sincerely hoped that the next day in Tatra Park would rectify. Thankfully, the next day did not disappoint. The sun was shining with all of its force when I woke up early Friday morning. I set off to find the bus that would take me to the park so I could hike out to Morskie Oko, a well known lakeside vista that the internet instructed me was a must see. After getting 16 different sets of directions to the bus station, I boarded a bus in the direction of Kusiniçe, which I would come to find out later was not at all where I was trying to go. I had a quick and sarcastic, “oh, great” moment, before I confirmed that there were some good trails in the direction I was headed in. And so, equipped with my trail map in hand, I started walking. 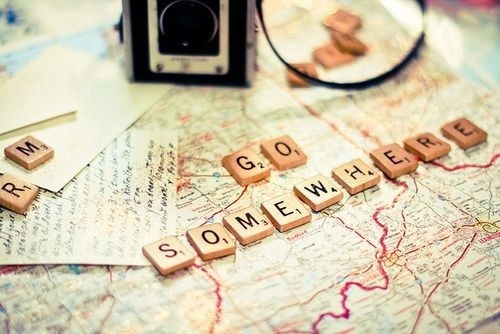 To where? I had no clue. I just climbed and climbed and climbed following the blue trail markers higher and higher. Along the way I met a few Polish trekkers and we exchanged some basics. They were astonished that I was from the USA and hiking alone in the Tatras. With a steep 5 miles behind me, I arrived at a large shelter. I asked around about where to head from there, and was told by various people that there was a lake nearby, perhaps another mile away. Again, I got mixed messages about where and how and if it was safe or not. Due to the glorious sun, the avalanche alert was high, and I was slightly under equipped for the snow without trekking poles or my gators, but I thought “what would Drake do?” And decided that he would tell me Y.O.L.O (you only live once). So I decided to heed the MOTTO and risk it in order to see the lake. I walked along this narrow trail — if you could even call it that — and arrived 45 minutes later to Czarny Slaw Polski or Black Lake as it’s called in English. Ironically, Black Lake was completely covered in white snow, and it took me a second to realize that I had arrived at my destination. I was almost completely alone, save for one other person, whom I passively cajoled into taking my photo after he watched me struggle with the auto-timer on my Nikon for a good 5 minutes. We chatted briefly, before he returned to his spot, content, like me, to be quiet in the midst of such an awe-inspiring view. 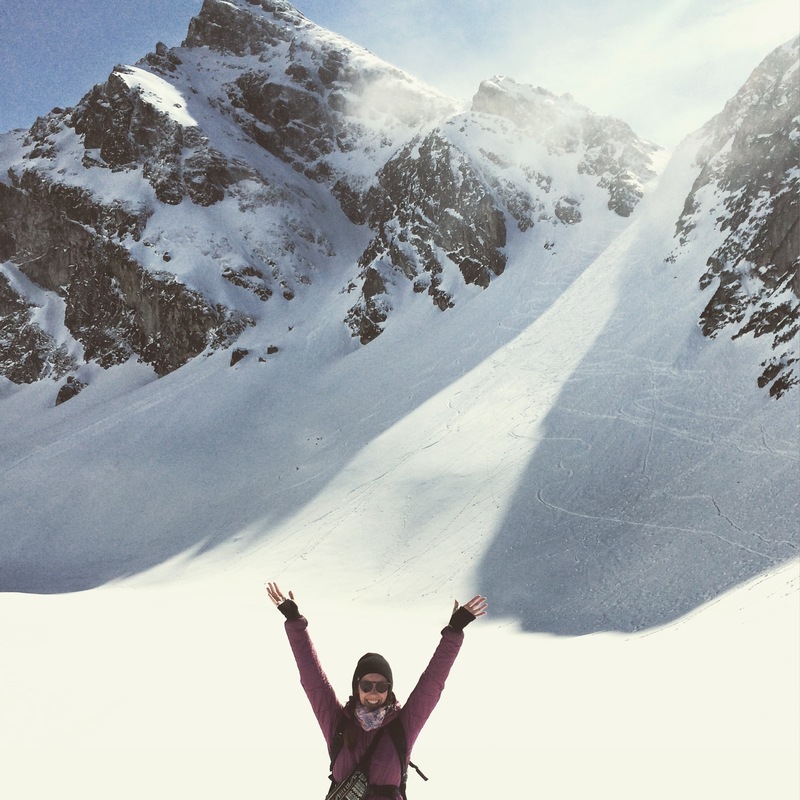 This was the peak that I was striving for, and the funny thing was that at the beginning of the day I had imagined myself fighting against throngs of tourists up to Morskie Oko–an achievable vista for people of all athletic abilities. My original game plan was to go easy on my first day and get my footing. I wanted to cordially get to know the park a bit before I conquered something more challenging. But of course, I never do things the “easy” way. I guess the universe knew what was best for me on this day. After all, I had set an intention that morning to proceed courageously. The Universe knew what I was craving and directed me accordingly. At the lake I found a nice boulder and climbed up on top of it. I sat with my legs crossed, inhaling and exhaling deeply. I traced the outline of the peaks before me with my eyes, trying to memorize all of their zigs and zags. I knew a photo would never accurately portray the view. As I sat, I meditated on my morning’s intention, and what kept coming up was how far I would travel for something or someone that I love. Sitting alone, deep in the middle of the mountains, on the border of Poland and Slovakia, thousands of miles from home, I confirmed that I would, indeed, move mountains for the ideas that I believe in and the people that I love. In order to do this, though, I realized that can’t protect my heart’s ambitions from the fear of failure or heartbreak. It just doesn’t work that way. You have to be willing to find yourself in the valley, if you ever want to reach the peak. Walking back down the mountain, I did my favorite 5-4-3-2-1 meditation that a friend taught me on El Camino de Santiago. To do this meditation you must describe, in as much detail as possible, 5 things you see, 5 things you hear and 5 things you feel. Then 4 things, then 3, 2, 1. I love this meditation because it brings you deeply into the present moment, insisting that you experience every detail around and within you. It doesn’t allow you to relive what has happened in the past or invent what will happen in the future. Just here. Just now. Just the conifer trees whose branches bow from the heavy green needles, or the silvery snow, which is pock-marked from the trekking poles of fellow adventurers, or the sound of a bird’s wings flapping, or the way your muscles tighten and release carrying you up and down the mountain. As the sun began to set over the mountain, I had to remind myself to proceed slowly down the steep and slippery trail. I didn’t want to get hurt, especially all by myself. So after finding center from my meditation, I allowed myself some music to help me concentrate and to keep the fear/exhilaration of being alone in these bold mountains from overwhelming me. I had already walked some 12 miles and knew that my legs were fatigued and I still had a few more to go. I had to keep it light, physically and mentally. After stopping in a restaurant for a beer and a face full of pierogies Ruskie, I reached my bed and breakfast, showered off and collapsed into my bed ready to sleep instantly. As I drifted off, I gave thanks for the blue bird day, for the exciting adventure, for the wise lessons mother nature always provides, and for the mountains I moved. 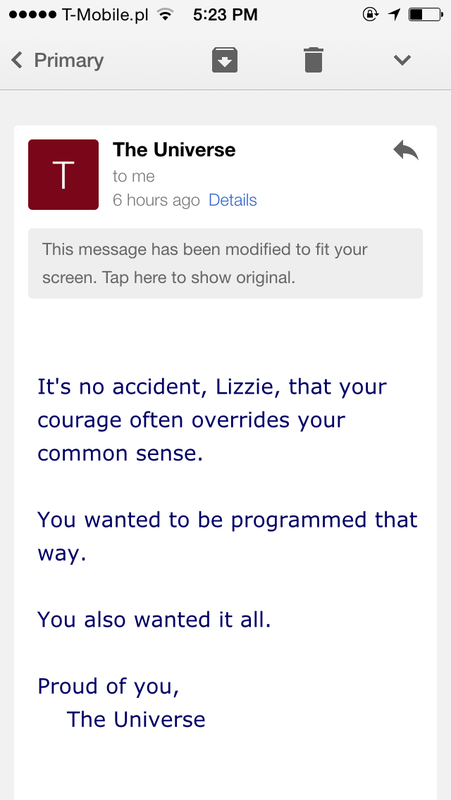 I received the following Note from the Universe to my email a few days ago, and I’ve been pondering the word courage since. What my Note from the Universe so aptly recognizes, is that I often act from my heart, though common sense would advise me otherwise. And while common sense is typically a value that we prioritize in our lives, I have found that acts of courage– acts of the heart–are the ones that have served me the most. In relation to my love of travel, courage has been a common thread throughout. Moving to San Francisco was an act of courage for me. Financially and logistically, it was beyond common sense. But I felt this feeling so deeply in my heart that it was right, and so I went for it. To follow suit, Burkina Faso, France and Morocco were of the same genre. Walking El Camino de Santiago was also in protest of common sense. What human being would think that walking 500 (painful) miles across Spain was a good idea, unless they knew that it was for the benefit of their heart. I’ve heard quite a few times on this most recent trip to Poland that I am so brave to travel alone. But I would say no, I’m not brave at all, I’m courageous. 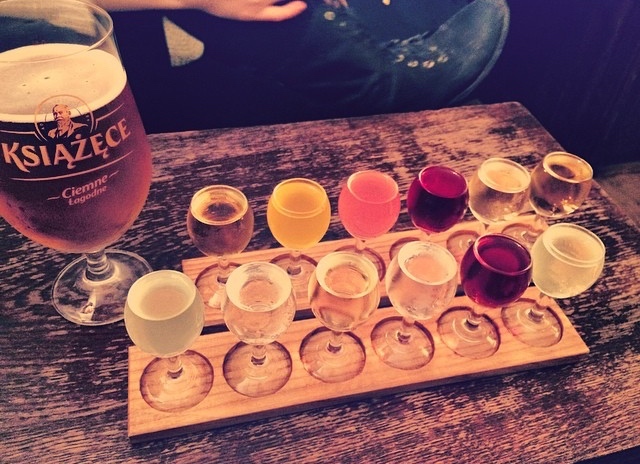 This solo trip across Poland has been a matter of the heart. I have friends who live all over Europe that I could have easily gone to visit on this vacation. That would have been common sense. But something in my heart was telling me to see this country while I had the opportunity, and I’m glad that I listened carefully, because it has been an incredible journey. I have seen many things, but as usual, the internal journey is always the most meaningful. I have learned from traveling solo, what it means to spend some quality time with myself. The amount of time that I’ve had to ponder my relationships, my passions and my purpose has been invaluable. It is crucial for me to spend time asking myself questions, listening to my responses and then pulling them apart and separating them into categories–head and heart. There is no better place to do this kind of digging than in another country. Why? Because you are outside of your comfort zone anyway. Once you’ve broken down that barrier of comfort, you can hear your heart more clearly. Couple this with the fact that your senses are on hyperdrive from experiencing the novelties of being in a foreign country, and you have a recipe for heart that is incredibly potent. Today I am setting off into the mountains in Tatra National Park in Poland. For me, there is nothing quite like the mountains to get my heart pumping with excitement. I am looking forward to hearing all that it has to tell me today. I woke up at 6:50 a.m in a drunken stupor from my night of Vodka. Auschwitz and Birkenau concentration camps were on the day’s itinerary and I had to make my way to the bus station in order to catch my 8:40 bus. I woke up and ate breakfast at my hotel—dark bread with cheese and meat, cucumbers and tomatoes topped off with a hard boiled egg. It was hearty and filling and I thought about taking food for the road, but decided I didn’t want to carry it in my little fanny pack. I set out on the bus for the hour and half trip west of Krakow to the town of Oswiecim. I had been anticipating that the day was going to be a difficult journey, but I had no idea just how taxing it would truly be. Upon arrival to Auschwitz, tourists are greeted by an administrative mindfuck. People are shuffled into confused lines—groups and individuals. Nobody knows just what to do or where to go as you approach the security checkpoint required to enter the museum. You have to elbow your way through a throng of people, just to be told that your backpack or purse is too large to take into the museum. Many people make it to the front of the line and then are promptly directed to the baggage check, only to have to rejoin the ridiculous line at the end. Thank god I didn’t have to deal with this (fanny packs for life), but I stood there pondering who the hell thought this was a good or efficient way to herd so many tourists into the gates of Auschwitz. In fact, while there are many rules for tourists visiting in Auschwitz, there felt as if there was no system to regulate the thousands upon thousands of people who visit there each week. Perhaps this speaks to the place itself– how can there be order in a place that doesn’t make any sense to begin with? After passing through security twice, once because it was required, and a second time because I had to use the restroom (…located outside of the security point), I checked in for my pre-arranged tour. I joined a group of thirty other English speaks as our tour guide took us on a 3.5 hour long journey through recent history. The camp, which was liberated a mere 71 years ago, shocked me to my core. Of course I’ve read about the holocaust and I’ve even been to the holocaust museums in Geneva and Jerusalem, but nothing could prepare me for the tour of Auschwitz and Birkenau. Nothing. As you walk through the world’s largest cemetery, you are overcome with a sense of disbelief. How could this have happened ? It just doesn’t make sense. We walked through the grounds at Auschwitz, and viewed the bone chilling evidence of the atrocities that took place there. 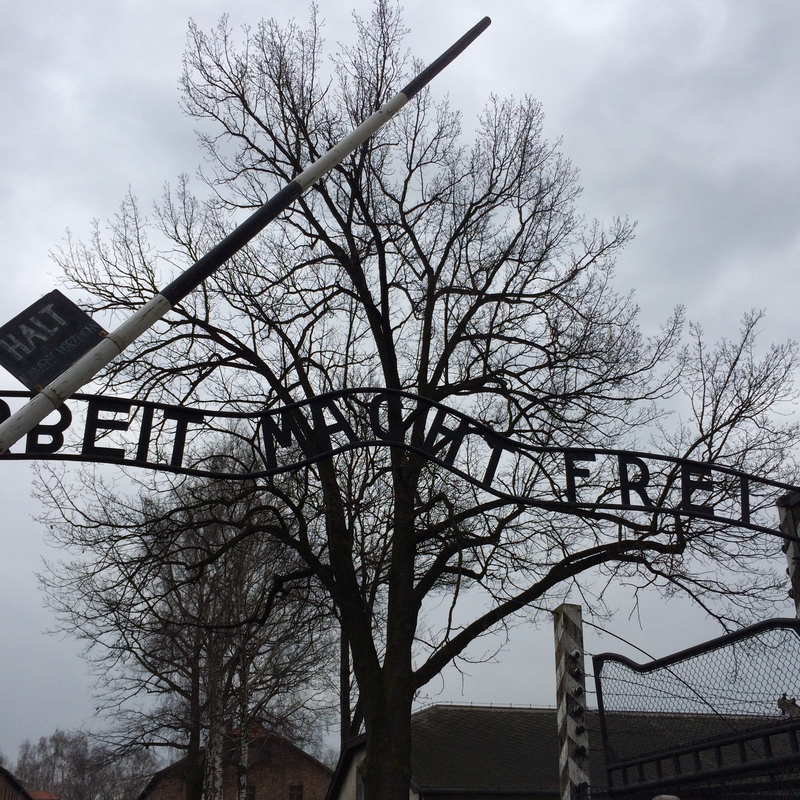 When you enter the camp you pass through a gate that says “Arbeit Macht Frei, ” which means “Work makes you free.” The sarcastic nature of this statement is maniacal. Walking in, you are told of a band, which played music in order to keep the prisoners marching in step and who would play classical music upon their return from a hard day’s work. Even imagining the sound was eerie, and my heart broke completely when I thought about how planned and perfect the Nazi Party’s final solution was. Every detail, right down to the soundtrack, was calculated and exact. The evil genius of it all sucked the life out of me. We were taken into rooms displaying shoes of the victims, both young and old, and suitcase upon suitcase marked with names and home addresses, demonstrating the hope of the prisoners that they would one day return home. They were stripped of everything—most of all their dignity. The hardest part of the entire tour was entering into a room, which was filled with two tons of human hair clipped off the heads of the women and children. It was could literally sense the total shock and disbelief of every single person in the room. It wasn’t a possession like the other things we were seeing. This was physical human evidence, and it was absolutely appalling. Our guide explained that the hair of these prisoners was used to make blankets and wigs for German civilians. In fact, everything from prosthetic legs of Jewish WWI heroes, to shoes, combs, glasses and even the ashes and feces of the the prisoners were recycled by the German S.S. The pangs of hunger I began to feel come the afternoon were juxtaposed with life-size pictures of starving 55 lb. prisoners. The perspective alone would have been enough to shut me up, though it didn’t need to because I had already been rendered mute. Birkenau was worse. You could feel the dichotomy of the painful deaths that took place there. Our guide explained to us the difference between anhilation and extermination. The first being the prisoners of Birkenau who passed from a slow and torturous existence if they were fit to work, and the second was the immediate mass murder of those deemed otherwise useless to the Nazis. As tourists we had the luxury of turning around and walking back through the gates, but for the prisoners there they weren’t as lucky, and many of them walked forward to their death. The remnants of the gas chambers and furnaces were horrific. The thought alone makes my heart break, but seeing them first hand is another thing in and of itself. Throughout the day tears would well in my eyes, but the shock of it all wouldn’t allow them to fall. My deep inhales and exhales only took the dark energy of the place into my cells. After the tour, I boarded the bus in the direction of Krakow, and immediately fell asleep. The life had been completely sucked out of me. Every limb felt as heavy as my heart. I walked back to my hotel and crawled into bed at 6:30 p.m. uncertain that I would be able to go in search of food, even though I had not eaten since early that morning. I knew, however, that I needed to take care of myself. 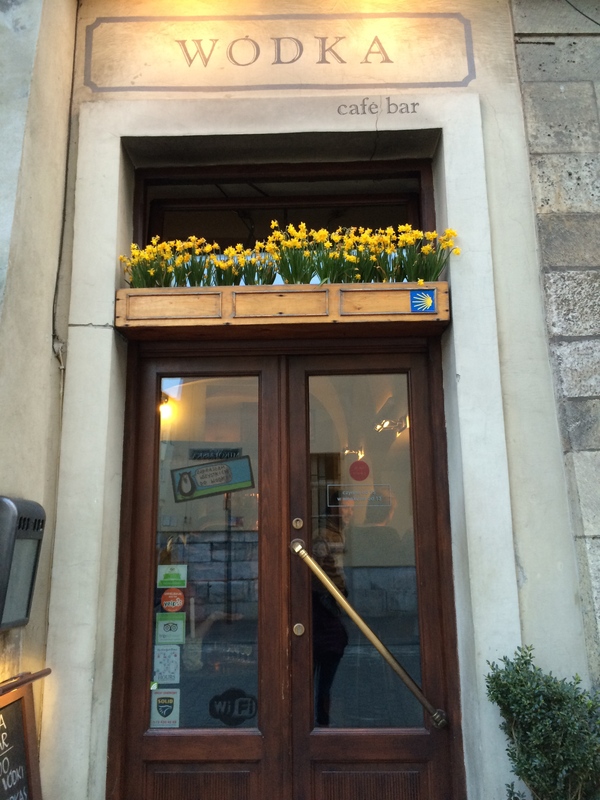 I needed to be comforted and fortunately enough for me, there was a local Milk Bar called U Babci Maliny 5 minutes walk from my hotel. I ate Grandma’s pierogies and cheese pancakes and drank a cold beer. Comfort food for my aching soul. I came home and finally cried, and it felt good to cleanse the disappointment I felt in humanity. It was a tough but beautiful day, and it reminded of the importance of striving for social justice. When we say, “Never again” we should mean that. Not just for the Jews but for all disenfranchised groups of humans. If I learned anything from my day at Auschwitz and Birkenau, it’s that a hateful ideology can evolve into so much more than words. There have been other genocides since the Holocaust, and ideological wars that have ravaged whole societies. We have to spread awareness, acceptance, understanding, peace and above all, love. Fear is the opposite of love. Fear builds walls, hope builds bridges. Here’s to the privilege of the future. When I started to plan this trip to Poland I read travel blog after travel blog about the best things to see and do. Knowing myself and how I like to travel, the two non-negotiables on my list of things to experience were culture and nature. I made up my mind that I would first go north to the city of Gdansk in order to experience what one blogger called “the most charming and romantic city in Poland.” However, as my trip drew nearer I realized that I had booked my flight to arrive over the Easter weekend and that the “charming and romantic” inhabitants of this city were going to be eating eggs and borscht and kielbasa with their families, as I strolled the empty streets and peered into windows of shops whose signs read, “zamkinęty” or “closed.” But I wanted a taste of the city nonetheless, so I started to email anyone that I knew who was Polish to see if they had family who would take me in and celebrate a traditional Polish Easter with me. Two days before I was scheduled to fly I thought that I would send out a few messages via couchsurfing.com and see if I got any replies. I sent out 8 requests and got 7 “declines.” But there was one family who agreed to host me. At first I only had communication with the father, Mariuscz. According to their profile, they were a family of four–a husband, wife and two daughters. As soon as I accepted the invitation, however, I started to think…I hope this is legitimate. As I boarded the train to Gdansk my thoughts were, this could be great…or this could be a nightmare. Crossing my fingers for my good karma to bring me into the home of a nice Polish family, I got off the train and was greeted with a big hug from Mariuscz and Matilda, their eldest daughter. As we drove back to their house I breathed a sigh of relief as 15-year old, Mathilda, told me that I was their very first couch surfer and that they were so excited to take me in and share their home, culture, holiday and city with me. When I arrived I met the mother, Patricia, and youngest daughter, Melanie. I settled in and we sat around the table drinking tea and getting to know each other. We shared tales of travels and hiking expeditions. They love to travel and see the world and they have instilled this value into their beautiful, well-rounded and mature daughters. As we talked I learned that Patricia and Mariuscz met walking on a pilgrimage to the relic of the Black Faced Madonna–a 500km trek by foot from their hometown Gdansk. When they met, Patricia gave Mariuscz the travel bug and they have made seeing their country and the world a top priority for their family. 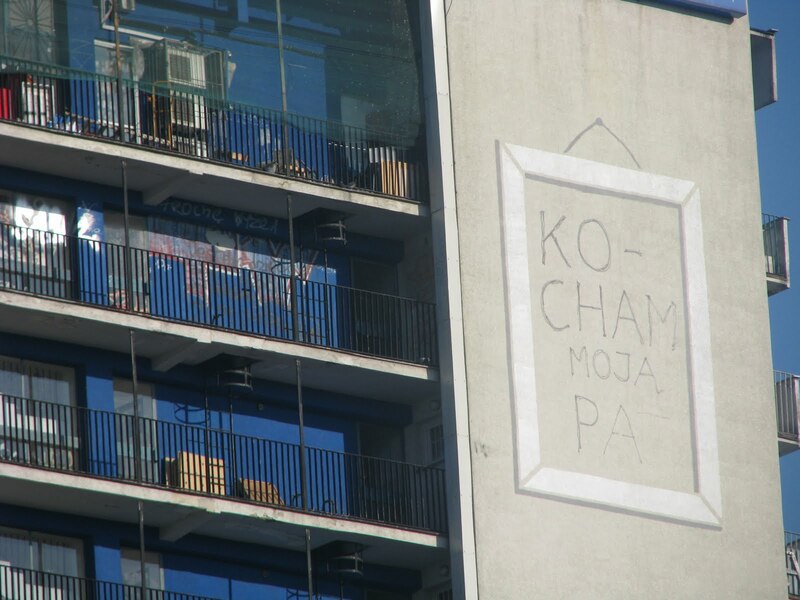 They also told me about a piece of graffiti he did many years ago on the top of the tallest building in Gdansk, that reads “kocham moja Pa” meaning “I love my Pat,”which had become very famous in the city. It’s a symbol of their incredible love, which knows no boundaries, and it’s for all the world to see. This morning when I woke up, Easter breakfast was on the table. We had an egg fight and then ate lemon salmon, stuffed eggs, potato salad and desserts until our stomachs couldn’t handle anymore. After breakfast the girls searched for their Easter eggs and then we got ready to go to church. Because we knew we had another Easter meal at 2pm, we decided to walk so that we could burn off some of our breakfast. We bundled up and set off in the direction of their church. We had walked less than 300 meters when I stopped dead in my tracks. Low to the ground on a metal highway divider was a trail marker for El Camino de Santiago. To my disbelief, the trail that I had walked 800 km on to Santiago de Compostella in Spain 2 years ago was right outside their front door! The spirit of pilgrimage came up once the last night, when Mariuscz and Patricia recounted their love story to me. In the back of my head I thought of my own pilgrimage to Santiago de Compostella, but then quickly brushed it to the side in order to let myself fall in love with their love. This morning, when I saw the marker, however, I was truly astonished. It was like El Camino was calling out to me to remind me that I am always on the way. I felt the magic of the trail once again and my heart swelled. The trail showed itself two more times throughout the day, and I laughed thinking that there was no coincidence. I was meant to be here and meet these amazing people. After mass we drove to Mariuscz’s mother’s house for MORE food. Seriously, these people have opened their doors and kitchens and hearts to me in a way that is so generous and kind and fattening. I’m going to need to buy some new jeans. 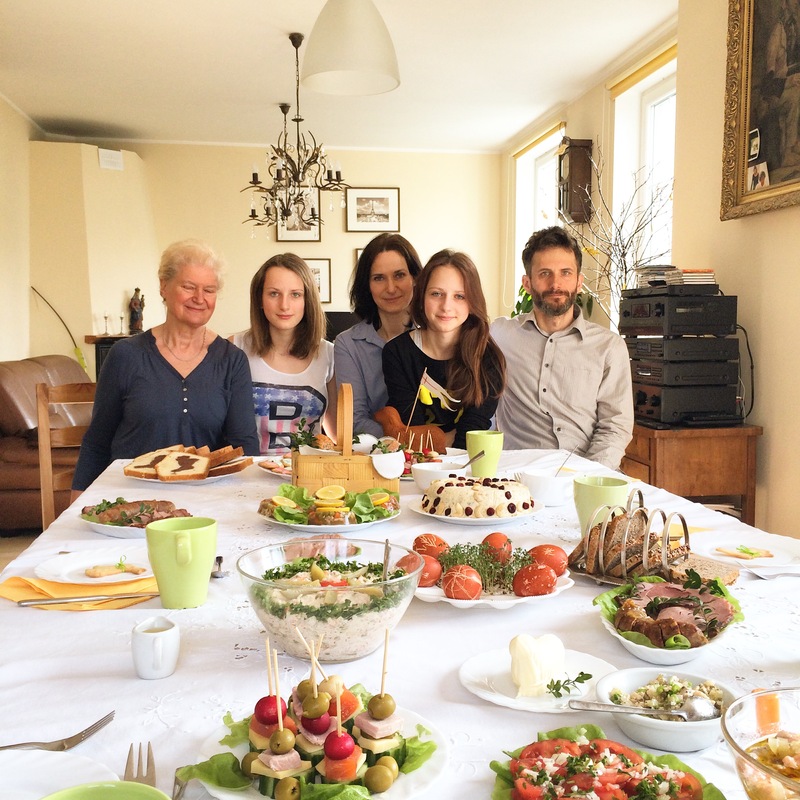 I thought I couldn’t be more grateful for their hospitality and sharing of their family’s holiday, but then they offered to drive me into Gdansk and give me a guided tour of their city. Gdansk is a stunningly beautiful and an amazingly strong city. It was burned to the ground in 1944 by the Russians, who were fighting over the city with the Germans. The devastation was massive and you can still see scars of the war everywhere. However, the rebirth is something like a phoenix from the ashes. It was a reminder to me of the resilience of humanity. Life is not always going to be easy, but sometimes we are meant to be burned to the ground so that we can wear our scars like badges of honor and flourish in the wake of catastrophe. We arrived back at home many hours later, exhausted from our epic day out. 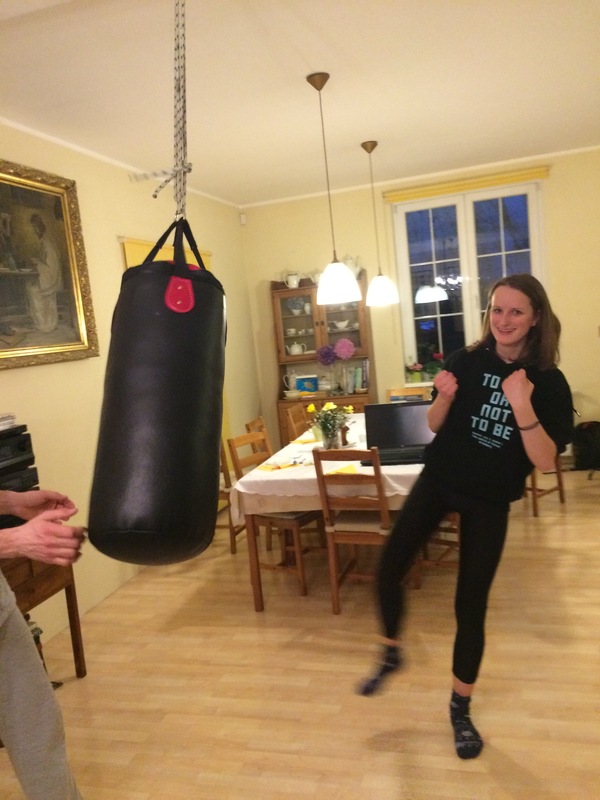 Mariuscz, Mathilda and I squeezed in a workout, and kick boxed against each other in the living room. The end to my perfect day was 10+ punches to the face…and I mean that in all seriousness. This family gets me. The gratitude is flowing as always.